Oh my, how I love to cook! I am always grabbing inspiration from some of my favorite cookbooks. Today I would like to share with you all one of my favorite kitchen tips that won’t even cost you a penny! Are you like me and cook from cookbooks or printed recipes that you find online? I am always finding some great recipes from our FREE ZipList feature that allows me to save recipes from all over the internet and save them all in one spot. What a cool feature! I then can add the recipe to a shopping list and ZipList will automatically create a grocery list that is categorized to your own grocery stores layout. Even better you have the option to create a meal plan that is right for your family! Check out ZipList, a fantastic FREE feature that Whole Lifestyle Nutrition offers and see how much it can help you in your day to day planning. So here is an awesome tip to help you in your kitchen. Do you have excess hangers in your closet that you just don’t know what to do with them? Use them as a recipe or cookbook holder. 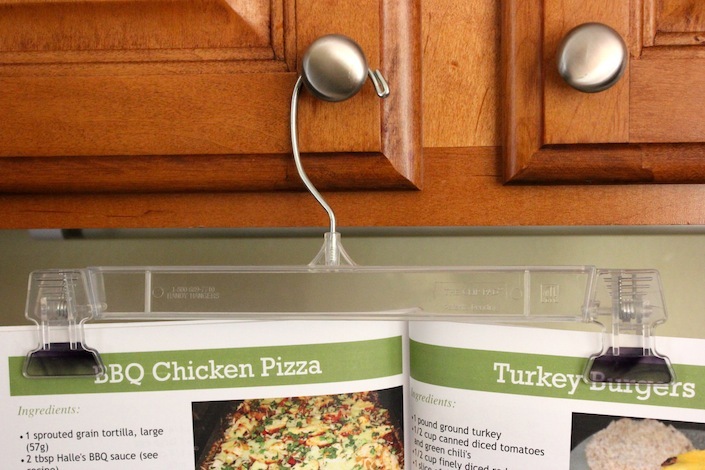 Simply attach your cookbook to the hanger and hang it form your cabinets. Your cookbook will be off the counter top and will give you plenty of workspace for you to work. 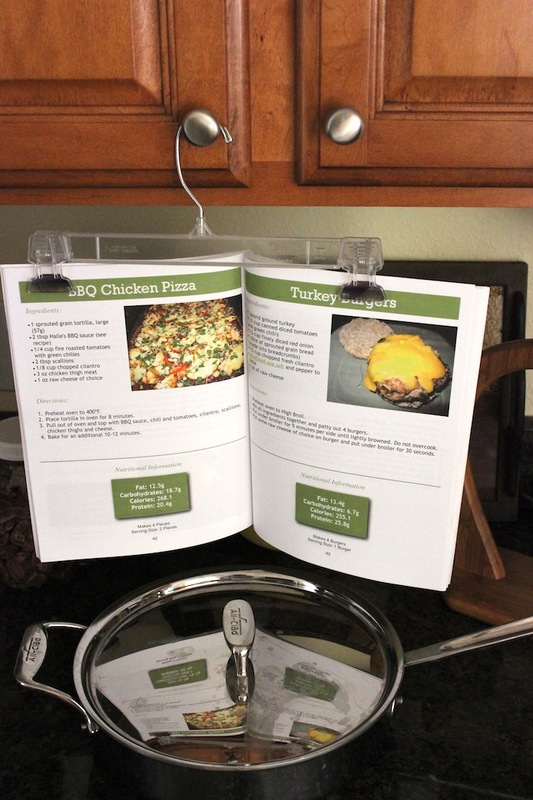 Another great feature is that your cookbook is now at eye level making it even easier for you to follow the recipe. What a cool tip! Do you have any favorite tips that you like to use in your kitchen? If so, please feel free to share them in the comments section below. Happy cooking everyone! Are you interested in our great cookbook featured in this post? There are some amazing, healthy recipes for you and your family to enjoy! LOVE, LOVE, LOVE This tip! Here is a great tip for your kitchen that will have you thinking “Why didn’t I think of that?” Also in this post I talk a little about our https://wholelifestylenutrition.com/articles/introducing-the-new-ziplist-features/ that allows you to save recipes from all over the web, create grocery list with on touch of a button and create weekly meal plans! Love this! So very clever and frugal too! Thanks for sharing it with us at <a href=”http://grannysvitalvittles.com/scratch-cookin-tuesday-8142012/”>Scratch Cookin’ Tuesday</a>! Great tip! It’s always tricky when the pages turn over while you are making a recipe!